Dark gloomy days call for crazy fun activities don’t you think? On the weekend we broke up the miserably grey days with a very silly pasta drawing prompt! Inspired by the Rockin’ Art Moms (a fabulous group of arty bloggers), who issued a macaroni challenge, I challenged my kids to use a variety of pasta shapes as a drawing prompt. To get started I hunted down some pasta – we just happened to have some different coloured and shaped pasta in the pantry which was perfect – shells, tubes and bows! We started with a line of little pasta tubes going across the page, which quickly turned into ants marching across the page. 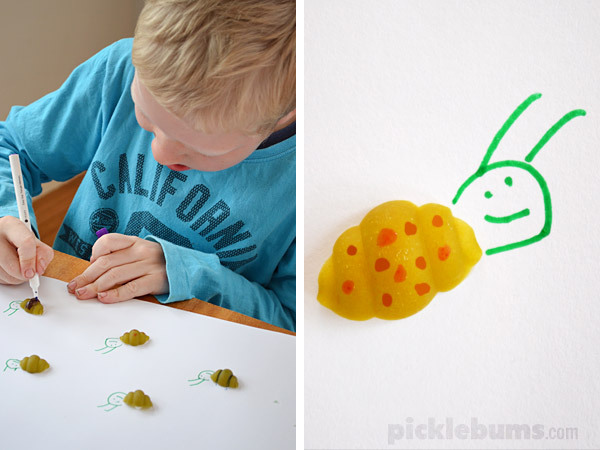 Then there were some little green pasta shells which became caterpillars and bugs. 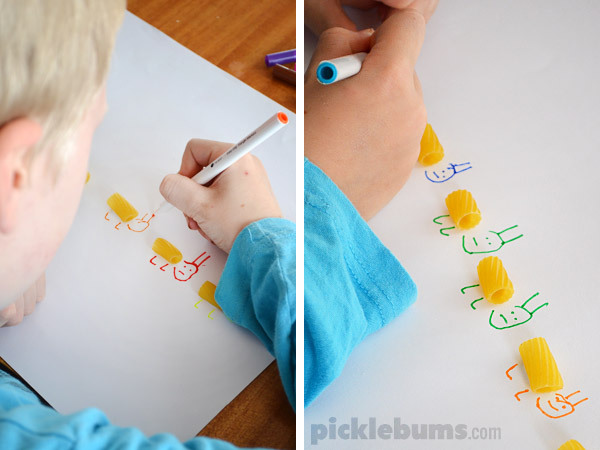 We experimented with drawing right on the pasta to add some more details which was cool! And then we tried some bows which became, birds, butterflies and a man with a really big bow tie! We made a fun video to show you the whole process. 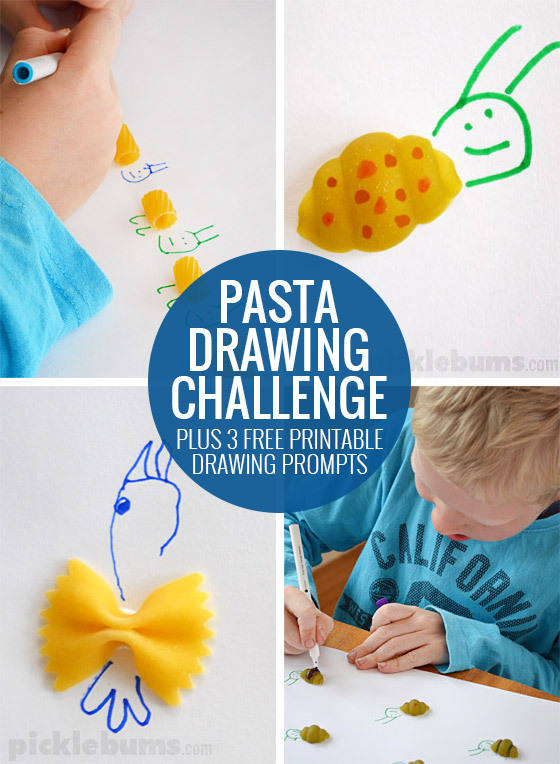 This is a super easy art project that is very low mess… and we’ve made it even easier and even less messy by making some free printable pasta drawing prompts. 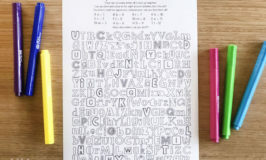 If you can’t get your hands on some pasta and want to give this a go simply print the A4 sized pdfs and start drawing. You can download the pasta tubes drawing prompt here. 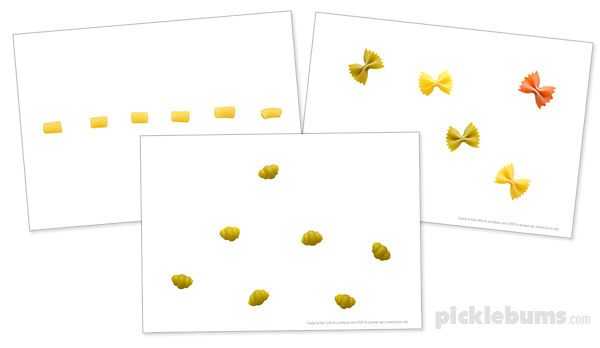 You can download the pasta shells drawing prompt here. 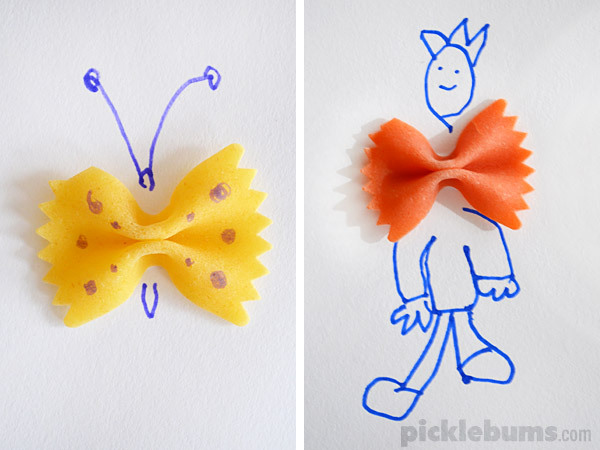 You can download the pasta bows drawing prompt here. 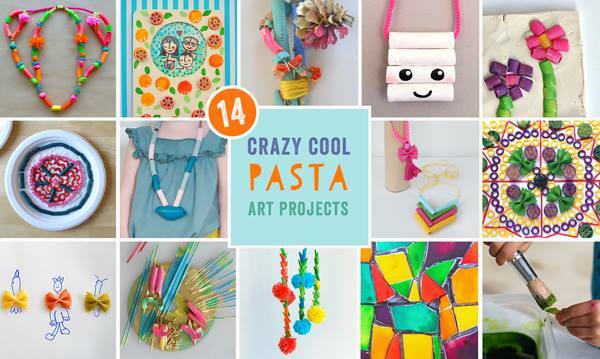 Check out the rest of the awesome Rockin’ Art Moms for more pasta projects! Are you inspired to make something amazing with pasta? The Rockin’ Art Moms are inviting you all you to join in the Macaroni Challenge! Please join us by creating you own unique pasta project and posting a pic on Instagram, twitter, or The Rockin Art for Kids Facebook Page using the hashtag #themacaronichallenge The challenge starts now andends on May 3. During this week the Rockin’ Art Moms will be sharing some of our favorite projects on our Facebook Page. If you are in the USA or Canada each project shared on the RAM Facebook page will be entered into a fab give away, find more details on the give away over on facebook. What arty of crafty project have you done with pasta? How fun is this! I love the little butterflies and the very big bow tie ;) Beautiful, Kate! What fun! Such a fabulous idea and I love the man with a bowtie :) Thanks for the printable too. I don’t normally have this type of pasta at home, so we can still be creative without having to buy special pasta. This is the funnest idea, Kate! I’m a huge fan of drawing prompts and this one takes the cake. This is a great concept. I love the idea of using different shaped and sized pasta. By the way, I really love the arts and crafts activities ideas on your site so much that I am going to send my readers across to have a look in a few days time in readiness for the holidays!